Economy watch: The Bureau of Economic Analysis has released its first stab at estimated second quarter GDP growth: a not very encouraging 2.4 percent. In the fourth quarter of 2008, GDP fell by 6.8 percent. But then came Obama's first year, a tale of steady improvement . 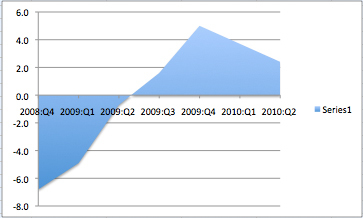 In 2009's four quarters, GPD growth successively registered -4.9 percent, -0.7 percent, +1.6 percent, and +5.0 percent. 2010 tells a different story. 1st quarter: 3.7 percent growth. 2nd quarter: 2. 4 percent growth. Consumer spending is slowing down, residential investment looks weak, and the bump up from inventory restocking that has been pushing GDP growth higher for the last three quarters looks about over. The one bright spot is strong -- 21.9 percent -- growth in business spending on equipment and software, but even there it's not hard to find a down side. The [business spending] figures highlight the contrast in the economy between high company profits and a persistently feeble jobs market keeping consumers at bay. If we were still have a meaningful debate about what the government should do with respect to the economy, the new numbers would clearly suggest some kind of fiscal or monetary stimulus response. But with the White House crippled by Republican intransigence and the Fed sitting on its hands, there's little prospect that anything will be done to change the current trajectory, either now or after the midterm elections. We're just going to have to wait it out.